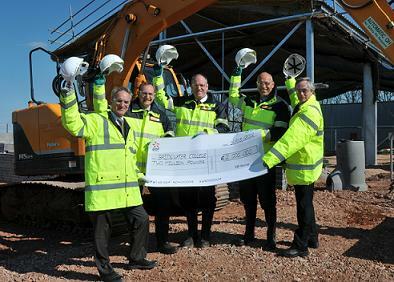 EDF Energy’s Richard Mayson hands over a cheque for £2 million to Bridgwater College Principal, Mike Robbins at the site of the new Construction Skills Centre in Cannington. Bridgwater College in Somerset has received £2 million from EDF Energy to help students and local people secure new skills, training and jobs for Hinkley Point C and to create a legacy of engineering excellence across the South West. The investment relates to a funding package, agreed with Sedgemoor District Council, West Somerset Council and Somerset County Council, to allow EDF Energy to undertake Site Preparations work at Hinkley Point C.
Most of this investment - £1.5 million - will go towards the Construction Skills Centre at Bridgwater College, which will provide a 'one-stop-shop' service to meet the training needs of the planned new nuclear power station at Hinkley Point, offering integrated training programmes across the College's sites. A new civil engineering facility, which is due to open later this year, is being built at the College's Cannington site. Covering eight acres, the new facility includes a single-storey, three-classroom teaching block with vehicle storage, and a maintenance and training area. It will accommodate a range of state-of-the-art training, including construction plant, building services, formwork, steel fixing and erecting, and new roads and street works. Further courses, delivered at Bridgwater College's other sites and based on partnerships with specialist providers, include computer-aided design and manufacture, electrical engineering, fabrication and welding, computer technologies, welding, maintenance and mechanical fitting, business administration, leadership, logistics and security. The remaining £500,000 is being spent on the Energy Skills Centre at Bridgwater College, which was formally opened by the Secretary of State for Energy and Climate Change in January 2011. The Energy Skills Centre has already received £500,000 from EDF Energy and is due to receive a further £2 million should planning consent be granted for the new nuclear power station. Richard Mayson, EDF Energy's Director of Planning and External Affairs for Nuclear New Build, said: "We're delighted to deepen our partnership with Bridgwater College, which will play a key role in transforming the South West into a centre of engineering excellence. This investment will open up exciting new training and employment opportunities for local people and is another example of EDF Energy delivering on its promises." The contribution to Bridgwater College is part of the latest instalment of £5.7 million of funding from EDF Energy relating to site preparation work at Hinkley Point C. The payment coincides with the start of the second phase of preparatory works, which includes on-site archaeology, vegetation clearance and fencing. The £5.7 million is split between West Somerset Council, Sedgemoor District Council, Somerset County Council, NHS Somerset, Bridgwater College and West Somerset Community College. It includes support for economic development, education, ecology, transport, tourism, community safety and diverting public rights of way. It also contributes towards the creation of new jobs, including employment skills and community outreach posts for Sedgemoor District Council, an outreach worker for West Somerset Council and a young persons support officer for Somerset County Council. Including the latest payment, almost £7m has now been invested locally out of a total of £30 million committed by EDF Energy relating to site preparations work. More payments will follow as work progresses. West Somerset Council approved EDF Energy's application for site preparations in July 2011 and a legal agreement was signed in January 2012 allowing work to start. In October 2011 EDF Energy submitted its main application to build and operate Hinkley Point C to the Infrastructure Planning Commission (now the Planning Inspectorate), committing to more than £500 million in mitigation, of which at least £150 million will be of lasting benefit to the community. The application is now being examined by the Planning Inspectorate.